Jack Reagan and his son, Neil, attended this church. Mrs. (Nelle) Reagan and son, Ronald attended the Church of Christ. Let's turn back the pages of history, to the early 1860's, and we find the Catholic Church has already come to Tampico. Rev. John Daley of Sterling rode his horse out here about three times a year to offer mass for our few Catholic families in the Hutten schoolhouse, nine miles south of Sterling, within the boundaries of the present Tampico parish. At times he offered Mass at some private home in the district. In the seventies Tampico was attended from Sheffield as the records of 1874 mention the services of Rev. Hugh O'Gary McShane, pastor of Sheffield, at present in Peoria diocese. In 1875 we were joined to the parish of Ohio,IL, and the Rev. P. J. Gormley traveled from over there to direct the building of the first Catholic Church in Tampico. Planning was begun in April, 1875, by a committee of four, consisting of Maurice Fitzgerald, George Dee, Thomas Burden, and Peter Burke. On the 20th of May, 1875, Right Rev. Bishop Foley, of Chicago, granted a charter to the Committee, authorizing them to raise subscriptions to build a church edifice. The Committee went immediately to work and in a comparatively short time raised an amount sufficient to erect and complete the first church. A part of the amount was raised by notes.from parties in that section of the County, and the other part, amounting to $2,520.00, by a Fair held at Tampico. At the Fair a tea set was put up for a prize. Two young ladies, one the daughter of Thomas Burden, and the other a daughter of Mr. John Gaffey, to be the contestants. The tickets were one dollar each and the parties could buy one or more as they chose, each ticket being a ballot for one or the other of the young ladies. The prize was awarded to Miss Burden, who received the most votes. It was a spacious church for those days, a frame building 40 by 9Oby 30, with a spire ll2 feet high. Father R. V. McGuire was appointed in September, 1879, as the first resident pastor here. The limits of the parish were the Northwestern part of Bureau County, which at present belongs to the Peoria diocese, the township of Tampico, Hume, Prophetstown, Hahnaman, and Montmorency. There were 963 members of the church, old and young, throughout the parish. In 1881 the F. McGuire purchased four acres near the church for the cemetery. Following Father McGuire were Fathers J. A. Fanning, J. Sullivan, A. Goulet, F. J. Kearney and P. J. Weber. Father Peter Weber built the first rectory in 1895. In 1902, he began construction of the present Catholic Church, the land was donated by John W. Glassburn, its dimensions were 150 x 50 feet with a spire 125 feet high. A winter chapel was also attached to the building. The church is of pressed brick with stone trimmings, Gothic in style. In 1901 a stone was brought here clear from Ireland, the old sod dear to many, to form the cornerstone of the new St. Mary's Catholic Church. The stone, which arrived in Philadelphia, came here as soon as Father Weber made out the necessary papers stating what the stone was for, so that duties would not be charged on it. The stone is about two feet square and came from the quarries of Nenagh, Lahoma, county Tipperary, near the tomb of Erin. Father Weber planned to lay the stone on the Fourth, which attracted hundreds of people here to witness the imposing ceremony. It was stated that the new church was the first one in the state to have a cornerstone imported from Ireland. Within two years the church was finished and on Thursday, September 8, 1904, the Most Rev. 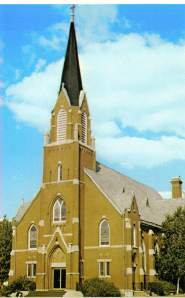 Peter J. Muldoon, who became the first Bishop of the Rockford Diocese, which was established in 1908, dedicated the new church, built at the cost of $30,000.00. The entire debt was liquidated by 1920. Father L. X. DuFour came to Tampico in 1906. He served Tampico parish for nearly 24 years. He was forced to retire in 1928 because his eyesight failed. He was suceeded by Fr. Lynch, who replaced the rectory with the present one for $12,000.00 and furnished it and retired the debt by 1929.